I feel like this post barely needs an introduction, I'm sure we all knew that one day I would end up at Creams Cafe in Newcastle tucking into a mountain of sugar, ice cream and chocolate when I should have been at home eating a sensible dinner! As a self confessed chocaholic, lover of cake and ice cream obsessive you're probably a little shocked that Creams Cafe hasn't been mentioned on New Girl in Toon before! An entire cafe dedicated to sweet stuff, where you can justify ordering dessert without pretending to care about your main course ... that's my kind of cafe! 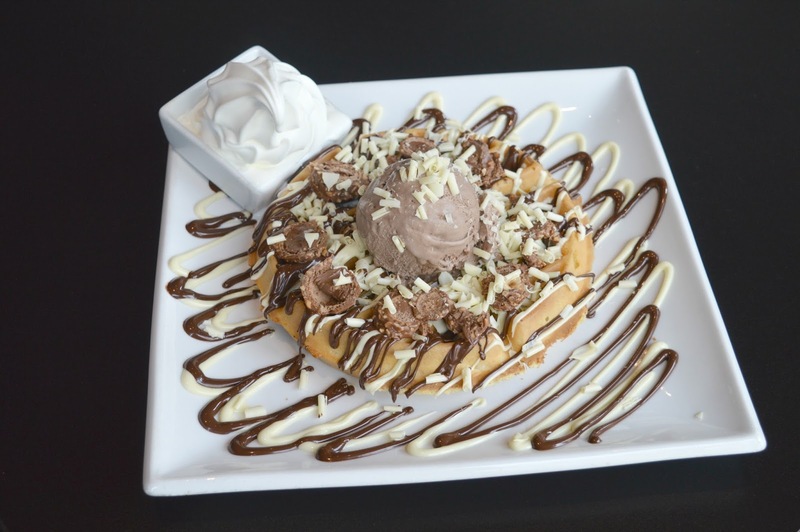 Creams Cafe in Newcastle are part of the UK's largest dessert only restaurant group that are popping up across the country at a great rate. With one new location opening every month since the end of last year, it seems I'm not the only person who can't get enough of naughty treats! 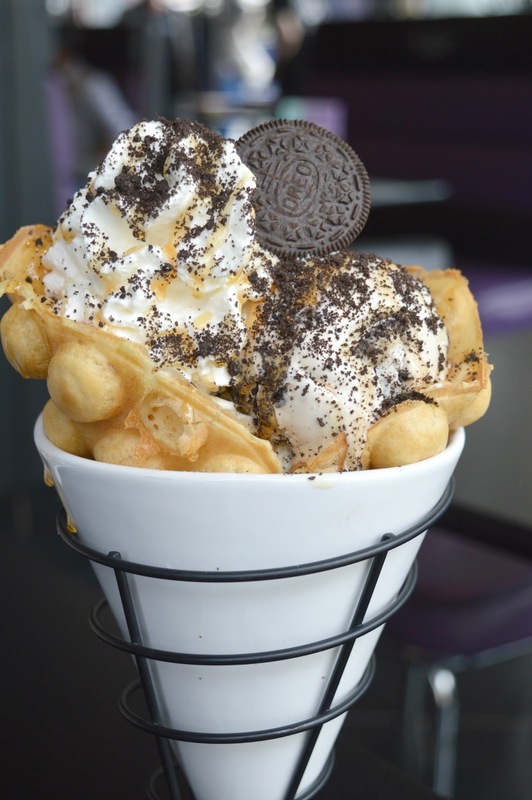 Serving a huge range of sundaes waffles, crepes, milkshakes and puddings, no one at Creams is going to tell you off for leaving your veggies, this is the kind of dinner your Mum would never let you have as a kid! Extra stretchy trousers at the ready, I took my good friend Sarah along for an evening of gossip and too much sugar. Is there a better way to spend a Wednesday evening? Reading the menu at Creams makes you feel a little like a ten year old being let lose in a sweet shop. Every treat you could imagine is there for the choosing and no matter what your weakness you're bound to find it in the Creams menu. For me there was only one option, their latest launch - the Bubble Pop Waffle! 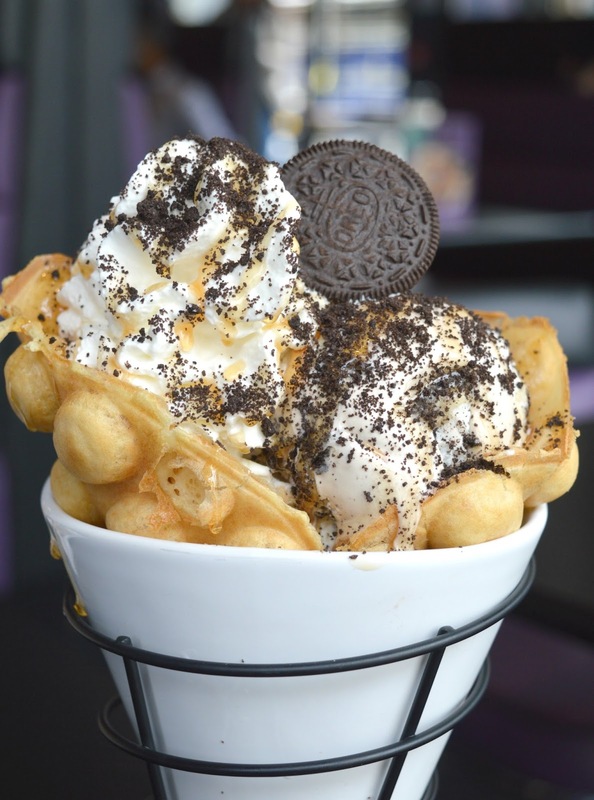 It seems the world has gone crazy for bubble waffles recently and it's easy to see why. 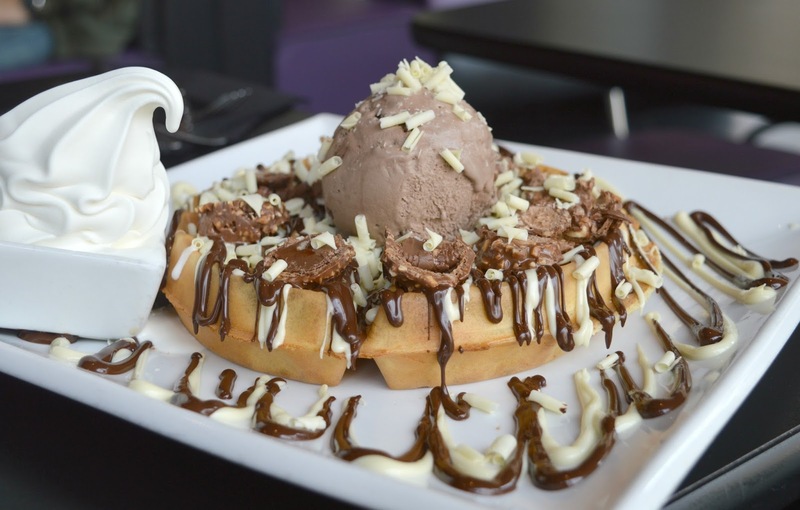 Giant bubble waffles wrapped round a mountain of fillings and stuffed full of ice cream, what's not to love! 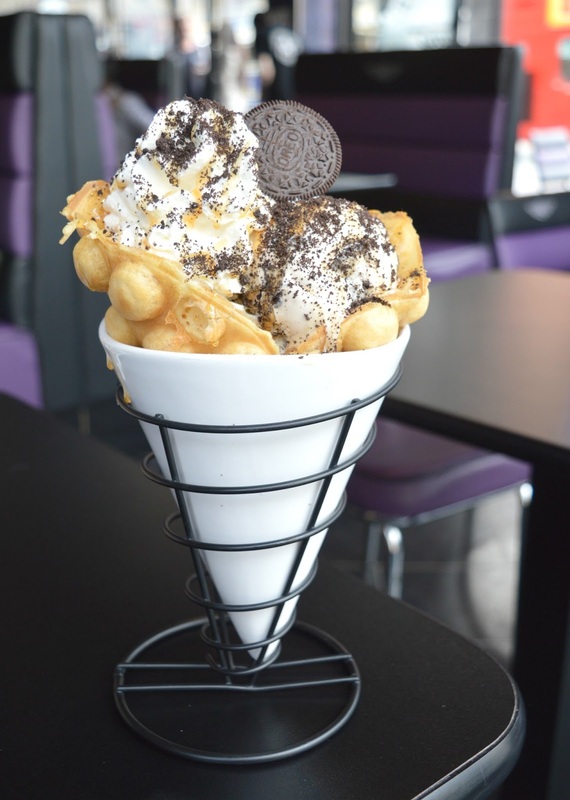 There's a variety of Bubble Pop Waffles to choose from at Creams or, you can create your own using the extensive choice of fillings available (they literally have everything!). On the recommendation of our lovely waiter I decided to order the More Oreo - vanilla ice cream, lashings of cream, Oreo pieces and so much butterscotch sauce it was dripping down the sides. Heaven! When my dessert appeared my eyes were out on stalks, it was HUGE! If you love your desserts extra naughty and greedy portion sized, Creams is the place for you. I eagerly tucked in, eating with a knife and fork as if that somehow justified having a giant dessert for my evening meal. I'm not ashamed to say that I ate the whole lot, even though I was struggling at the end! It was delicious! Sarah decided to order the brand new creation on the Waffles menu; The Choc 'Fr'enzy - Choc'n'hazelnut gelato served with crushed Ferrero Rocher, chocolate shavings and a crazy amount of white and milk chocolate sauce. Her plate was huge and I don't think I've ever seen her so happy. She announced several times how excited she was as she tucked in. She was so impressed that she was constantly trying to make me try some, despite the fact I had to keep reminding her about my nut allergy! Feeling slightly larger than when we entered the cafe we finished our desserts with very happy tummies and a slight chocolate fuelled buzz. I honestly wish I could eat dessert for dinner every day of the week - what a treat! As we left we did a quick drive by of the ice cream counter making a note of all the flavours and dreaming about what we'd order on our next visit. 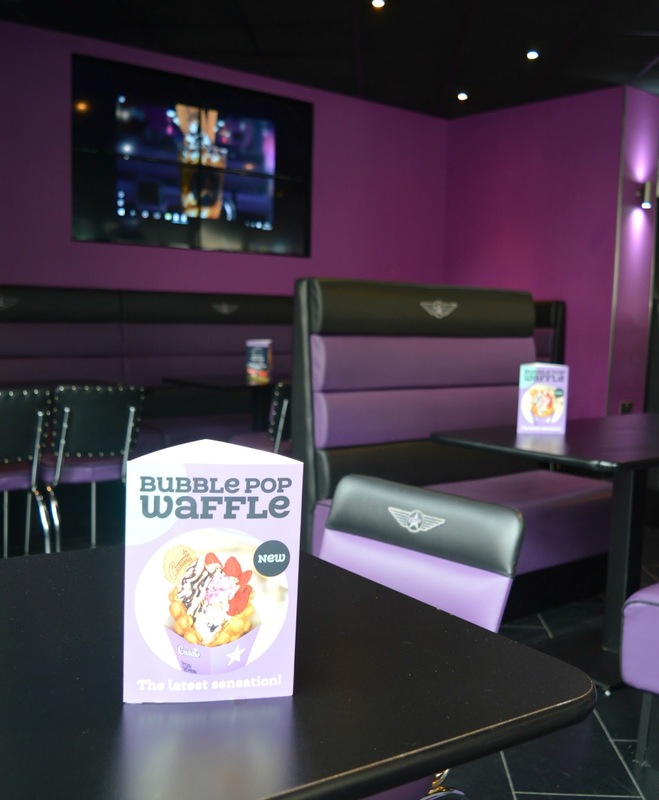 Creams Cafe is definitely somewhere we'll both be returning to and I'm pretty keen to create my own Bubble Pop Waffle! Make sure you let me know what you'd stuff into your dream Bubble Pop Waffle - I'm looking for inspiration! 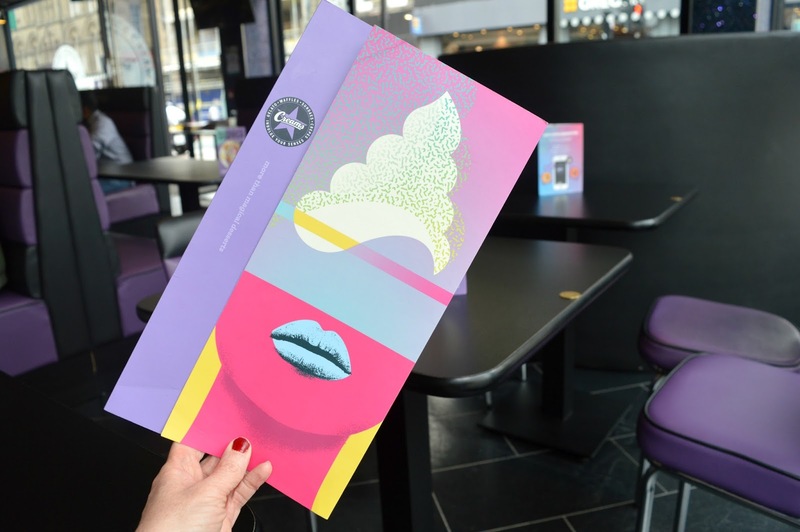 We were invited to enjoy a complimentary meal at Creams Cafe in return for an honest review. All opinions are my own. Wow, I think I got a sugar rush just reading this! All the chocolate and caramel please! Wow these look absolutely incredible! I've never heard of this place before but I've just googled it and it turns out there's one right here in Nottingham - I know where I'm headed to next!